For most folks, a high-priced, high-design, purpose-built bassinet with a useful life of a few months just doesn't make sense. If you're gonna drop a few hundred dollars or more on a sleek bassinet, it had better keep earning the floorspace it takes up by transforming into something else. 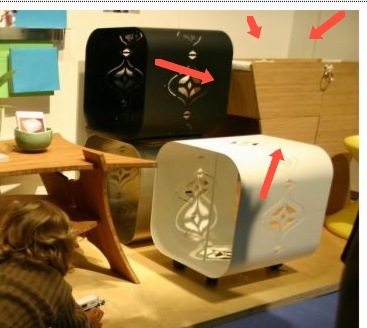 Well, that plyboo-looking cradle dealio in the IDSA@ICFF booth I wondered about in NotCot's photo gallery turns out to be the YiAhn Bassinet, a rather remarkable, modular design by Chul Min Kang with more sequels than Beethoven. 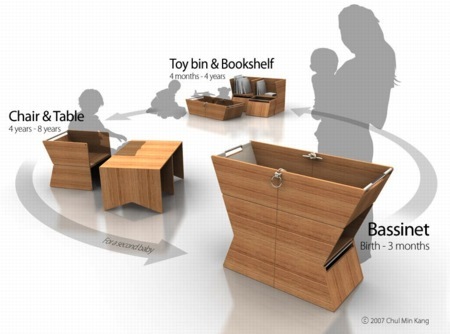 It transforms into a bookcase and a toybox, and/or a play table and chairs. And then it turns back into a bassinet "for a second baby." Clearly, they're targeting the Korean grandmother market, too. Brilliant. 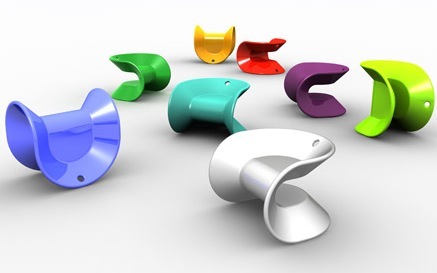 Kang's on a kid-design roll; his sweet Min Chair, a Pringly, multi-use rocking chair/stool/ride-on toy, won an Idea Award last year from the IDSA and Businessweek. This guy has "living in a NY apartment with a kid" written all over him. This is some awesome design BUT with all the babyproofing my friends and wife are prepping me for (I've avoided it so far as the kid is not yet mobile) this seems to have a lot of pointy corners.